A report from the Institute for Public Policy Research (IPPR) published today, 19 July, calls for a new US style institute for teacher training for teachers who work in the most challenging areas. It claims that poor quality professional development is contributing to many teachers not progressing. The report has been covered by the Guardian, Schools Week and the TES. The coverage doesn’t take into the account the fact that schools are responsible for the training of staff and are free to take advantage of a wide range of opportunities. In fact, we trust schools to make decisions about ongoing professional development that is right for their staff. Furthermore, just last week we introduced a new Standard for Teachers’ Professional Development that sets out good practice, how to achieve effective progress and more. We are also supporting the establishment of an independent College of Teaching that will champion for high quality teacher training and we are supporting schemes like Teach First and the National Teaching Service to get the best teachers into classrooms in challenging areas. High quality teaching is vital to ensuring all pupils, irrespective of birth and background, receive a world class education. We want high quality professional development to be the norm in all schools and we trust schools to make decisions about training that are right for their teachers, pupils and the school community. 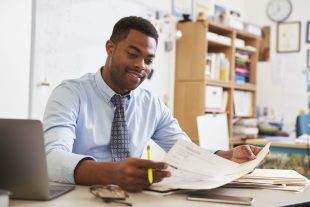 To support schools, last week we published a new Standard for Teachers’ Professional Development, setting out how to achieve effective progress, identify good practice and raise expectations among teachers and schools. We are also supporting the establishment of an independent College of Teaching to further raise the status of the profession and champion teachers’ training. We have also funded the expansion of Teach First and announced the National Teaching Service, to bring outstanding teachers and leaders into challenging areas. Find out more about the Standard for Teachers’ Professional Development here.